Ugh! Yuck ! Pew! Ack! And not just any wallpaper, but this lovely stuff. I've been slowly, and I mean slooowwwly, trying my best to remove the ohsobeautiful wallpaper I inherited here in the rooms I inhabit. Seriously, was this pattern ever popular? Well, it's not for me, that's all I can say. Anyhoo, I have grand plans for this bathroom. Can I just tell you - I HATE removing wallpaper. And I also hate it when builders feel it isn't necessary to prime the walls before putting the paper up. You know what happens when the walls aren't prepped properly, don't you? That's right - you must resign yourself to the fact that drywall patching will be in your very near future. So, today I've been ripping that wallpaper out. And before you think I've got so far in one day, let me clarify by saying that it's taken me weeks to get to this point. I thought I'd just leave it until I had time to do it all at once, but I'm sure you'll understand when I tell you that I just couldn't make myself keep looking at that every day. So what did I do? I tore off the top layer (thank the lord it was strippable), and I stared at the yellow backing for several more weeks! That I may as well take the rest of it off. So I did. And now I'm removing all of that yellow liner. I've torn some degree of wallpaper out of all 5 of the rooms just to see how much trouble it was going to be. 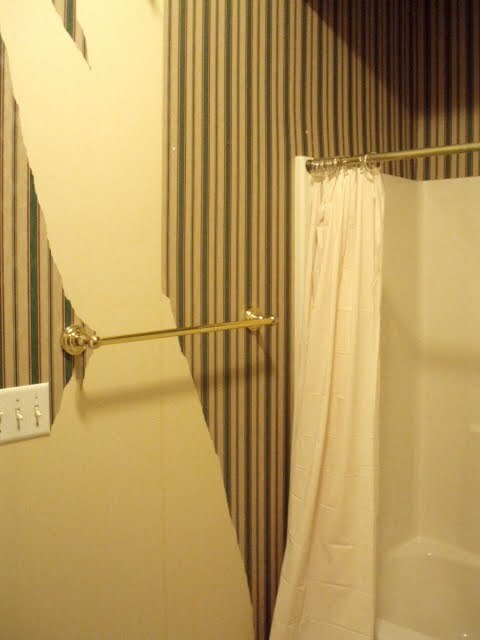 I can assure you that in this room in particualr, the wallpaper hanger used at least 15 extra gallons of glue. I know this for a fact because I am currently stuck to the wall. TIP: Now, for those of you with wallpaper stripping in your future, here's a great homemade solution I discovered purely out of frustration. I tried EVERY solution I found in the stores and on the internet. Nothing seemed to be the right thing for these walls, so I came up with my own remedy that seems to be working great to remove all that glue gunk. Be sure to mix with warm water. It'll help to pull the glue off the walls better. You can get a chemical sprayer at Walmart or Big Lots for about $10, and it's well worth it. Put it in a gallon jug and shake it well. Then pour that into the sprayer. Turn off the breaker to the room, cover your switches and outlets, and then spray the walls really good. Let it sit and work for about 15-20 minutes so that it has time to loosen the glue from the wall. If it has dried when you are ready to remove it, simply spray it again with a light coat of the mixture. Scrape the paper off with a flat blade or an old credit card. *Score the top layer first so that the solution can get below the top surface. Well, it's back to work for me! 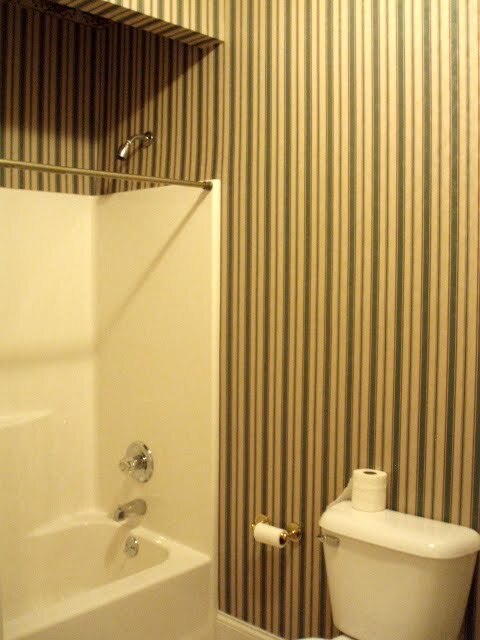 What easy solutions have you come up with to remove wallpaper? elbow grease! just kiddin' - no matter which way one goes about it, it's WORK! by the way...it looks great! Oh Polly! Five rooms of that awful stuff. Your hands must be worn thin. 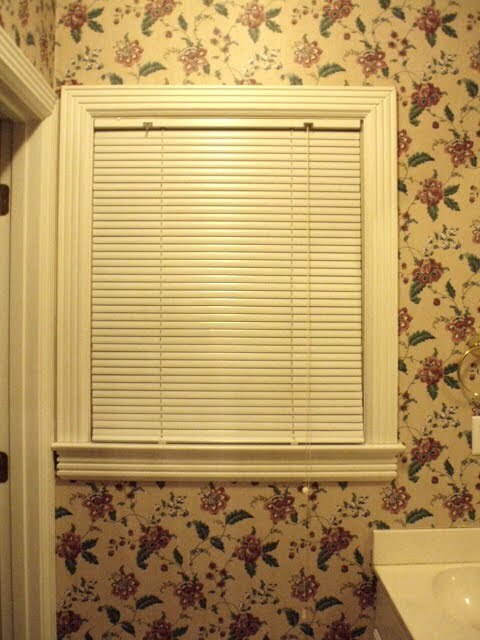 I was striping wallpaper in my foyer and dinning room in our last house and everyone who came to the house during the process had to rip a piece or two off themselves. Maybe you need to have a party? Keep up the good work the bathroom already looks like it is 15 years younger. I feel your pain, really I do. I had it in only one room and that was all I could take. But I do have cathedral ceiling which made it even harder. We had to rent a steamer, it was the only thing that helped. I had damage too. I used a flat paint to camouflage what didn't get repaired all that well! Oh, and I used a tinted primer first to seal in any glue that was left behind. I was so scared of the paint not sticking! Oh, I've been there and I've done that! It will be over (and worth it) someday soon. You're making some real progress! Give yourself a break and treat yourself to something for all your hard work. The man that removed some wallpaper in my family room before painting used the same mixture you described with Dawn detergent soap. He swears by it. I grew up in a home with every thing wall papered. My mom loved changing rooms out. Me on the other hand, not so much. But what did I know, I wall papered a few accents walls. Mistake. It was such a PAIN to take down when I grew tired of it. Once down though, the real fun begins. It looks like you made a lot of progress in that bathroom. 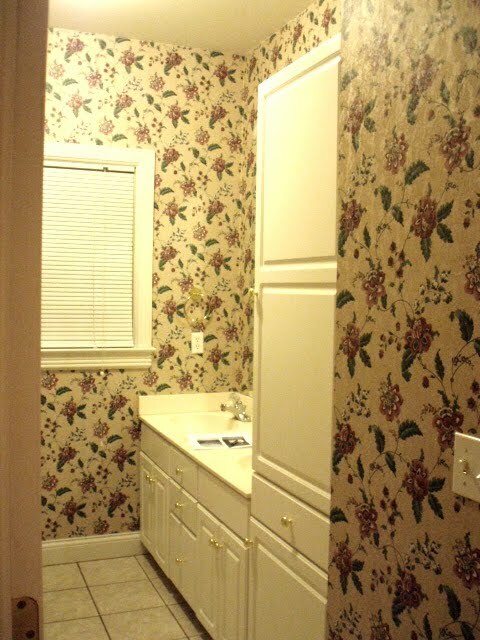 I remember my big wallpapering craze in the early 90's. I feel sorry for whoever bought my house in Wisconsin because I don't think there was one wall not wallpapered when I left that house. But I did size every wall before I papered so it should have come off easily (at least that's what the sizing was supposed to do). Look forward to seeing the final reveal of the room. GREAT progress you are making. I have three bathrooms I want to do this with...I am still fighting the mental battle, and just need to go forth; you've encouraged me, so it has not been for naught. Hang in there, girl! I totally sympathize with you. I have done this and it is not a fun or rewarding job. Looks like you have a handle on it though. 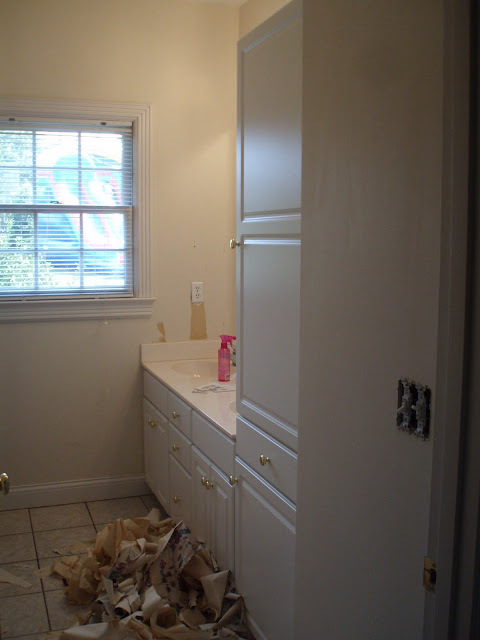 Won't it be fun redoing that bathroom. It looks a lot better already. A Wagner wallpaper steamer. My wallpaper nearly rolled off all on it's own. I even removed an old vinyl floor using it! Heat is amazing for softening glue. I empathize with you. That was one wild west bathroom! YOUCH!!! Does your head spin from being that up close and personal with all those graphics?!? Well, at least they coordinated the stripes with the floral, Polly! 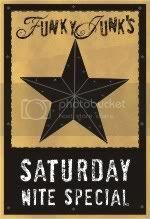 : ) I've been there, but only had to do a powder room and we were the ones who had put the paper up. I used fabric softener from the dollar store. I had kind of peeled the top layer off of mine, too. I just rolled it on in sections with a paint roller, waited 5 minutes then used a flat blade. 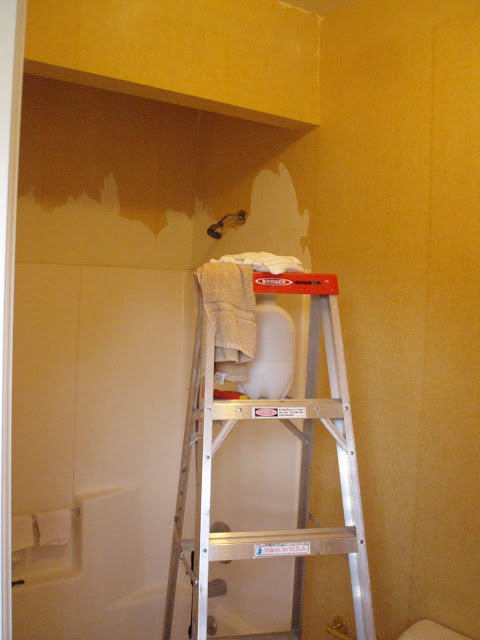 It was probably the easiest time I ever had removing wallpaper! We used our clothes steamer, if I remember correctly - the store bought spray stuff didn't work. We only had one wall of the ugliest silver metallic, black and yellow wallpaper to remove. It was a breeze! However the glue on the wall was a bummer to remove. I remember scrapping and collecting all this gummy goo for days. Dawn detergent was used to wash the walls - which worked out really well. I'm sorry that you have so much work to do. But I know once you are done those rooms are going to be magazine worthy!!! Our hall bath had a border over paint over wallpaper. I used vinegar in a spray bottle and it all came right off. Even the layer underneath the wallpaper covered in paint and topped with a border! Wallpaper is the devil. Polly you are a stronger woman than I am for sure!! I have done this before and what a chore. You did GOOD~! We also had 3 rooms with multiple layers of wallpaper and border on each.. I'd scrape awhile and cry awhile but at last it was off.. Good luck and I know it'll be beautiful and so worthwhile when your finished..
now, that seems like a really big job! i would love to see the new look of your bathroom! I too am cringing at that paper but remember when it was the "in" thing many years ago. A family member of mine recently had to remove 7 layers of wallpaper in her 100 year old house. A horrible job to be sure. I have no doubt that when you are finished it will be fabulous. Thank you so very much for your kind words and support. I feel at peace knowing that God is in control. In regards to the contest, truthfully I am loving Zach's video. He is so funny and such an inspiration. Given that the votes are free and plentiful he has gotten mine quite a few times. Gosh, Polly, what a job. I hope I never need this recipe again. I've been there... P.S. 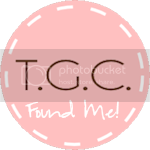 Your junking post (below) is amazing, I can't wait to see what you'll come up with. I feel your pain...I'm currently stripping a bedroom...and it's no fun! I did just pick up a tip on HGTV the other day that I'm going to try. Put 1/2 hot water and 1/2 fabric softener in a spray bottle. They scored the walls, but the top layer of my paper strips easily enough, so I'm just going to spray it on what's left and try that.